Gather downtown this summer for a free, family-friendly celebration on Friday nights that includes live musical performances, activities for kids and a market in the park; wine, dining & shopping at downtown businesses; a cruise in for unique and antique cars on Fourth Street (no registration required); and an end of summer Lantern Festival including a lantern parade around the park. Bring your family and friends for the true local’s experience in Downtown Dayton! “Like” our Facebook page for updates, including music performance schedule, on 2019 events! 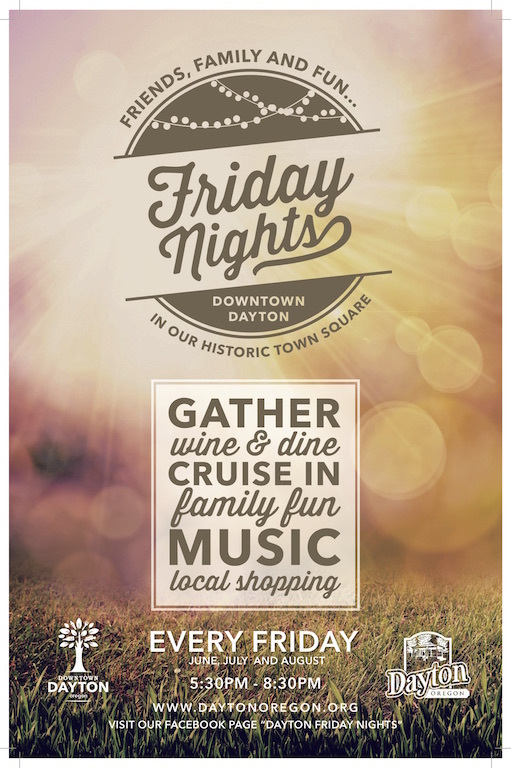 Friday Nights is jointly presented by the Dayton Community Development Association and the City of Dayton, in collaboration with downtown businesses. Interested in volunteering at Friday Nights 2019? Send us an email at info@daytonoregon.org. We’d love to have your help! OUR SINCERE APPRECIATION FOR OUR 2018 FRIDAY NIGHTS SPONSORS! These concerts would not be possible without their generosity to the community. Please thank them by supporting their businesses. Seating for concerts: A limited amount of seating is available on provided benches. Bring your lawn chairs and picnic blankets! Cruise In is free, no registration required, and located along Fourth Street (closed to non-cruise in traffic) abutting the park. Dogs on leash and under control of owner. No smoking or alcohol allowed in the park. No driving allowed onto park grounds. Goal of Friday Nights: To build community, create a sense of place and strengthen the local economy by drawing hundreds of visitors and residents to downtown Dayton to interact in and around the historic park and enjoy weekly live music, kids activities, a cruise in, shopping and dining.